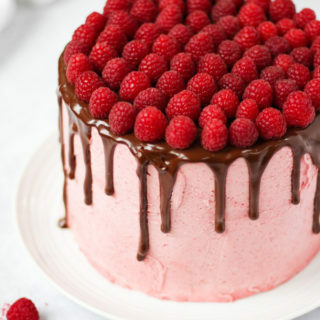 Learn how to make a show stopping Raspberry Cake - Chocolate cake sponge, with raspberry flavour and delicious fluffy raspberry buttercream icing, topped with chocolate ganache and fresh raspberries. The perfect birthday or celebration cake! Stir in the melted and slightly cooled chocolate and the raspberry flavouring. Spoon into your tins, smooth out with the back of a spoon. Make a bit of a dip in the middle to account for rising. Add in Waitrose Raspberry Dust. Now for your crumb coat - Coat the outside with the icing and smooth well, use a really good thick layer to achieve the best result. Now run a clean, smooth scraper or palette knife around the cake, smoothing the icing. Put the cake into the fridge for one hour, or the freezer for twenty minutes. Cover the top and sides of the cake with the buttercream icing and smooth. Return to the fridge for twenty minutes. Pipe your ganache on to the edge of the cake to give the drip effect. Cover the top and smooth with a palette knife. Cover the top of the cake with fresh raspberries.